President of the European Council Donald Tusk has said that any "back sliding" on commitments made so far on Brexit would create a risk to further negotiations. "This applies also to the question of avoiding a hard border," he said. Mr Tusk was addressing the media with Taoiseach Leo Varadkar following their meeting in Government Buildings this afternoon. 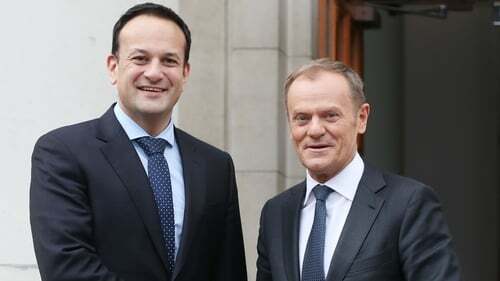 Mr Varadkar said the two had an "extensive discussion" about Brexit and he thanked Mr Tusk for his "solid and sensible leadership" and "unwavering support for Ireland in our unique concerns". Mr Tusk went on to say that he noted that the UK government rejects a customs and regulatory border down the Irish Sea, the EU single market, and the customs union. "While we must respect this position, we also expect the UK to propose a specific and realistic solution to avoid a hard border. "As long as the UK doesn’t present such a solution, it is very difficult to imagine substantive progress in Brexit negotiations. "If in London someone assumes that the negotiations will deal with other issues first before moving to the Irish issue, my response would be 'Ireland first'." Mr Tusk said that while the EU must recognise the democratic decision taken by Britain in 2016 to leave the EU, the EU must recognise the democratic decision made on the island of Ireland in 1998 with all its consequences. "The risk of jeopardising the fragile peace process must be avoided at all costs, so we will be firm on this," he said. Mr Tusk referred to a speech by the UK's Chancellor of the Exchequer Philip Hammond yesterday in London where he argued for a bespoke deal, or an ambitious free trade agreement, covering financial services. Mr Tusk said that in the FTA the EU can offer trade in goods with the aim of covering all sectors subject to zero tariff and no quantitative restrictions "but services are not about tariffs". "Services are about common rules, common supervision and common enforcement to ensure a level playing field, to ensure the integrity of the single market and ultimately to ensure financial stability. "This is why we cannot offer the same in services as we can offer in goods. It’s also why FTAs don’t have detailed rules for financial services. "We should all be clear that also when it comes to financial services life will be different after Brexit." Mr Tusk said that since he last visited Ireland he has spoken to virtually every EU leader and "everyone of them, without exception, declared ... that among their priorities are protecting the peace process and avoiding a hard border. "The EU stands by Ireland. This is a matter between the EU 27 and the UK, not Ireland and the UK. " Mr Tusk's visit comes before the European Council meeting of EU leaders on 22-23 March on Brexit and economic affairs. Tánaiste and Minister for Foreign Affairs Simon Coveney has suggested the EU could block British Prime Minister Theresa May's plans to maintain a soft border between Ireland and the UK while leaving the customs union. This is Mr Tusk's second visit to Ireland in three months. He has already pledged that the EU will stand with Ireland on the border issue and the Government’s efforts to ensure the frictionless passage of people and goods. Mr Varadkar is also due to hold a separate meeting with the secretary general of the Organisation for Economic Co-operation and Development (OECD), Angel Gurría.